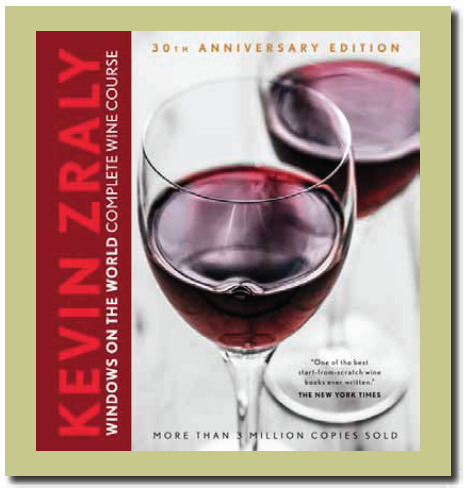 This 30th Anniversary Edition of Kevin Zraly Windows on the World Complete Wine Course reflects the remarkable longevity of this book that is the all-time bestselling guide to wine with over 3 million copies sold. I cut my teeth on this book many years ago when pursuing my early thirst for wine knowledge, and have referred to it frequently since then. Zraly became the cellar master at the newly opened Windows on the World restaurant at One World Trade Center in 1976, and ran the Windows on the World Wine Course there until September 11, 2001. His book was first published in 1985, and since then he has been recognized as one of the most influential wine educators in the world, having received a James Beard Award for the Wine & Spirits Professional of the Year. This revised 30th anniversary edition is completely redesigned and updated with an added section on his personal remembrances of Windows on the World. This is the definitive book for learning the basics of wine, and includes chapters on demystifying wine, the varieties and types of wine and how they are produced, and recommended wines and values and where to locate them. The text is peppered with hundreds of instructive labels and QR codes that allow one to access additional pronunciation guides, videos of Zraly teaching about wine, and online sources of the wines mentioned. The strength of the book lies in its succinctness and the sidebars that contain nuggets of information that emphasize points and anecdotes, and offer valuable personal commentary. Also included is a suggested format for tasting wines featured in the book, and answers to frequently asked questions about wine. This is a valuable reference book for beginners, intermediate wine knowledgeable consumers, and even well-versed wine geeks. Hardback, 368 pages, published October 2014, available widely, SRP $27.95.